Although computers and graph paper are great tools for creating designs for bead weaving, there are other options. Designing an image to weave on a bead loom is not as daunting as it seems. If you look around your home, you will find the tools you need to create an inspired and unique design. Crayons, photographs, pastels for example, can hold the key to a great design. Any full-sized picture–tapestry weavers call such pictures “cartoons”–can be your muse. This advice was gained through experience. As a tapestry weaver who wanted to experiment with bead weaving, I was skeptical whether beads could convey a sense of color and texture the way fibers can. Fiber absorbs light and beads reflect light. Fiber is soft and beads are hard. I was could make my own yarn through spinning and dyeing, but there was no way I was going to make my own seed beads. To get a real idea of the difference in these two mediums, I decided to create a bead weaving based on a photograph of a plate holding pears and peaches, the same photograph I had once used to create a tapestry weaving. I warped my loom to correspond exactly in size to the photograph turned on its side. I pored through my bead stash and found fifty tubes of size 11/0 seed beads whose colors could be found in that photograph. Keeping in mind the method that tapestry weavers use, I placed the photograph behind the warp of my bead loom. I looked at the photograph and the edge that would be the first row of beads. Then I used my threaded needle to pick up beads that were the colors I saw. I didn’t think about the picture; I just thought about a the colors I was seeing in the first row. The first few rows were not very impressive, and it wasn’t until the tenth row that I began to see shapes emerging. Those little beads became the dots of color in a pointillist painting. Since the picture was on it’s side, I did not allow my concept of what a plate of peaches and pears should look like interfere with the beaded piece my hands were executing. I used all fifty colors. Some rows contained twenty or more colors. Many colors were closely related, like the five shades of white. After I wove in the last row, I turned my loom on its side. Sure enough, there it was: the plate of peaches and pears in all its glory. I walked across the room to look at it. To my astonishment, the image was crystal clear from fifteen feet away. My understanding of pointillism deepened significantly in that moment. I had been watching the weaving progress from a distance of inches. That the weaving translated best from many feet away was astonishing to me. A four-by-five-inch bead weaving is small format, and yet the beads seemed to speak as loudly from a distance as they did from close up. After realizing that the tapestry method of using a cartoon could also work for bead weaving, my whole outlook on bead weaving changed. I could use anything as a guide. To prove that this was possible, I quickly made a small abstract sketch with pastels using some very lively colors to contrast with the rather dull colors I had used for the plate of peaches and pears. I used about twenty colors of Delica beads for this weaving. The color areas in my pastel sketch were not distinct. Between a yellow and green there emerged a third and fourth color. By looking very carefully at the space between colors, however, I was able to find beads to match so that the emerging bead weaving had the same feel as the pastel drawing. As the weaving progressed, I was thrilled to discover that beads could capture such subtle blending of color. I realized that any image could be created with beads since beads are simply points of color. If carefully arranged, those points of color can add up to a perfectly shaded, blended, complex design. You can take any image–from a slice of a picture you’ve taken to the latest crayon creation taped to your refrigerator–and turn it into a bead weaving. Try making a collage of family photographs or finding a picture of your flower. Use your digital camera to take a picture of pebbles or the bark on a tree. Anything can become a beautiful bead weaving because beads make everything beautiful. Tell yourself you are an artist today, and with beads in hand the sim0plest of tools, you can create a masterpiece. Warning: make sure you use a great loom like the Mirrix! Tapestry and cloth weaving have less in common than their sharing of the word “weaving” would indicate. Both are indeed weaving and share the following characteristics: They rely on the interlacement of warp and weft; the warps (the threads that are attached to the loom) run parallel to each other; the weft (the threads that are woven into the warp run at right angles to the warp and inter-cross. But that is the extent of their relationship since the balance of these two very different weaves produces final products that are radically different from one another. Cloth weaving can be either simple or complex but the resulting fabric is always somewhat balanced. By this I mean that the ratio of warp to weft is fairly even so that both show, possibly one more than the other, but still creating enough of a balance that the warp and weft are visible. Tapestry, on the other hand, is completely weft-faced. This means that the warp does not show at all. Just this difference alone is enough to set these weaves completely apart. A fabric that is completely weft-faced will be much stiffer than a balanced weave and, because the warp does not show and hence does not affect the appearance of the fabric, the application of the weft is all that counts in creating a design. The difference does not end here. Tapestry involves the use of discontinuous wefts. No given weft ever travels across the entire weaving (generally speaking), whereas in cloth weaving wefts generally do travel across the entire weaving. Cloth weaving can produce stunning works of art intended for both decoration and clothing, but in general its purpose is to produce functional material. Tapestry has been used to create functional items such as rugs, saddle bags, and other items intended to be sturdy and withstand wear. But tapestry is most famous for the wall hangings created to decorate and insulate the walls of castles. Many different cultures have created tapestries and within those cultures certain techniques dominate, creating some confusion as to the difference, for example, among a Navajo rug and a European tapestry or a Coptic tapestry. The basis of all these tapestries is essentially the same since the warp is covered and the resulting fabric is pictorial and that design is based on the placement of the weft alone. Although both cloth weaving and tapestry can theoretically be created on the same kind of loom, there are dedicated cloth and tapestry looms that provide certain elements to facilitate the proper weaving of each. A cloth loom does not require the same kind of tension that a tapestry loom does. However, more than two shafts (the movable parts of the loom that hold the heddles and allow for the raising and lowering of the warps in order to create a shed, which is simply a word to describe the space between these two sets of threads) is preferred for a cloth loom in order to produce the stunning possible number of weaving structures. Tapestry, on the other hand, requires a lot of tension but only two shafts (although some tapestry looms, such as Navajo looms, do not have any shafts but rather employ a more manual method for separating the threads). There are looms that will accomplish both cloth weaving and tapestry, but in general it is best to have looms devoted to one or the other. A cloth loom will generally not provide the necessary tension to weave tapestry and will potentially provide options that are not at all necessary for tapestry. A good analogy would be the mountain bike versus a road bike. You can ride a mountain bike on the road but it’s a lot more efficient and faster to ride a road bike on a road. It’s nearly impossible to ride a road bike on a dirt trail. If you intend to do both with passion you are best off owning both kinds of bikes. I find that the personality that loves tapestry does not necessarily love cloth weaving. I am of that ilk. The same applies in the opposite direction. Cloth weavers are able to patiently set up their looms over the course of hours and days and then quickly weave yards and yards of cloth. Tapestry looms are relatively quickly set up but the weaving takes a very long time. The relative nature of a cloth weaving is predetermined by the threading of the warp. Certain elements can be modified, of course, by the shedding pattern (which warps are raised) and the choice of weft, but since the warp shows its color and threading cannot be changed during the course of weaving, the major elements of a cloth weaving are set in place when you warp the loom. Since the tapestry warp is completely covered by the weft, it can only effect the tapestry by its set (how close or far apart the warps are spaced) and the size of the warp. The warp has to be in correct relationship to the weft so that the tapestry remains weft-faced. 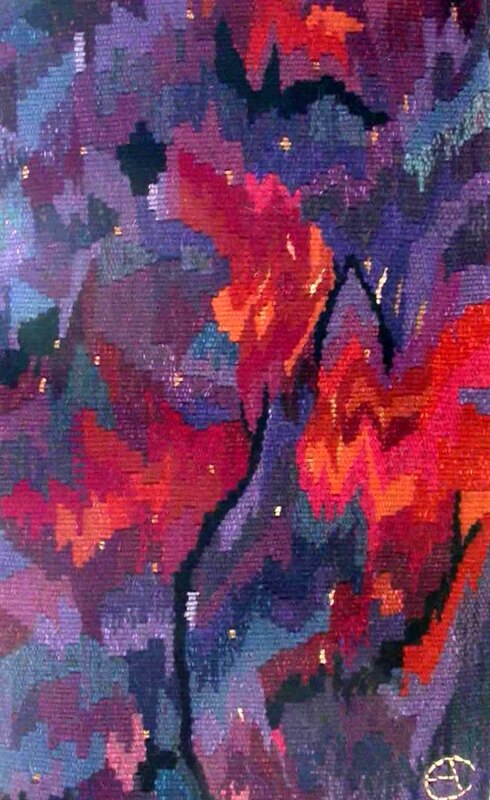 Tapestry is like painting. The warp creates a canvas on which one paints with fiber. But unlike painting, the final and necessary structure of the “canvas” is only created once the weft is applied. Hence, tapestry becomes a very architectural kind of artwork since the structure is created from the bottom up. What was woven at the beginning cannot be changed after the fact. One does not have the luxury of the whole page to play with since the page only exists in the tapestry as the “paint” is applied. It’s an interesting constraint that can create as many mistakes as accidental successes. But whereas tapestry is like painting, it is also still weaving and hence takes its own unique place in the world of art.